Ficus ginseng is a superb indoor plant that is much liked for its superb root trunk and its very ornamental foliage. Leaves grow directly from the large root, producing an amazing effect. It is easy to care for, and here is how to water it, prune it or when the best time to repot it is. Although it is easy to care for, Ficus ginseng does nonetheless require a little care to give it all the chances it needs to survive over a long period and in proper growing conditions. Ficus ginseng appreciates the warmth that is customary indoors in apartments and houses, ideally from 60 to 75°F (15 to 25°C). It loves having good light but not direct sunlight. Ficus ginseng doesn’t cope well with brutal temperature variations. Repotting every 2 years in spring (or fall) is almost mandatory. In exceptional cases, if it’s cared for perfectly and environmental conditions are perfect, your Ficus ginseng might even bloom and bear fruit! It’s ok to let temperatures drop to around 54 to 60°F (twelve to fifteen degrees Celsius). Don’t let it get any colder. Water a bit less in this season. Spring and fall or autumn are ideal to repot ficus ginseng, with a slight preference for spring if you’re late in the season. These two seasons are major vegetation phases for the Ficus, meaning leaf and root growth is highest. Let the pot dry out without watering for 2-3 days. Select a pot that is larger than the previous, ensure it drains well. Keep soil from leeching out with mesh wire and gravel or clay pebbles at the bottom. Use fresh bonsai potting soil mix to replenish nutrients. At this point, if you aim to keep your Ficus ginseng cute and small, it’s good practice to trim branches back by about a third. 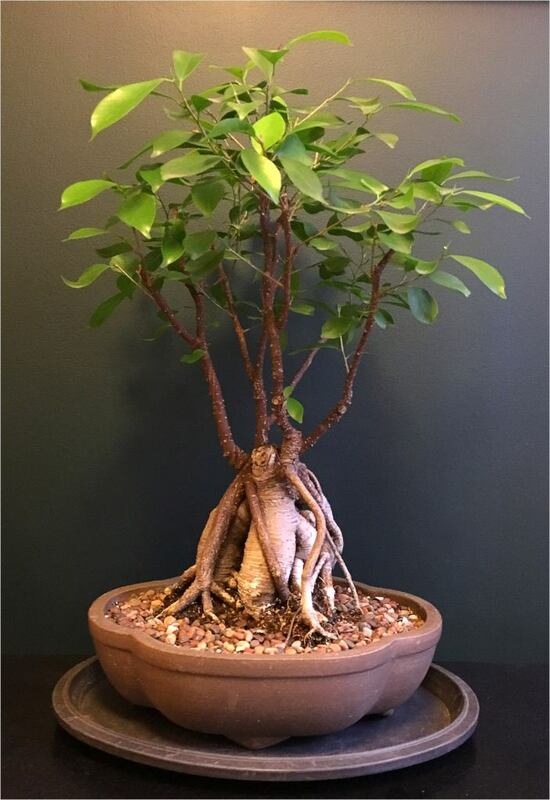 Unpot your (trimmed) ficus ginseng and run a cultivator along the roots to remove old depleted soil. Cut off about one third or one-fourth of the roots, to trigger root growth. Place the root clump level with the top of the pot, showcasing the nicest roots above soil level so that you find it appealing. Backfill with fresh soil mix, press down, and water. Water the ficus only when the surface of the soil is really dry. In summer, it is often necessary to water a bit more, especially if outdoors. Ficus ginseng doesn’t like standing water. Empty the saucer after having watered. Your ficus ginseng will appreciate having its leaves cleaned often with a rag or a moist paper towel. Ficus ginseng loves it when air moisture is high. You can mist the leaves often with soft water, especially in winter. You might also rest the pot on a tray of clay pebbles that can be filled with water, without having the pot touch the water itself. If you consider your Ficus ginseng to be a bonsai, and that you want to keep its shape small, you’ll have to prune it regularly. Snip new shoots off as they appear for the original shape to be preserved or to make it evolve to the shape you wish it to take. Pruning the Ficus ginseng on a regular basis will lead it to branch out more. Prune winter growth in spring, and if outside, remember to pinch new shoots off as they appear. A good rule of thumb is to wait for 8 to 10 new leaves to form, and then remove half of them. It will trigger new branches to sprout and foliage will grow more dense and beautiful. Sometimes the Ficus ginseng comes with small branches grafted on a larger root. If ever you notice shoots sprouting from below the graft joint, pinch them off: they’re sometimes not the exact same variety as the initial branches. Not only would the ficus change shape and demeanor, but grafted branches would be deprived of sap and die off. The grafted branches are from small-leaved varieties, and the vigorous root stock comes from larger-leaf varieties. It might be that your Ficus ginseng is simply watered too much, that it lacks surrounding moisture or light, or that it is set in a place full of drafts. Ensure that you only water when the soil is dry. Check that where the plant is placed matches the requirements described above, lots of light but no direct midday sun. This is often caused by red spider mites. Simply treat it with organic mite killer sold in horticulture stores. Read our page on how to fight red spider mites. This is usually due to mealybugs or scale insects to which the Ficus ginseng is very vulnerable, especially indoors. This may be because the Ficus ginseng is grafted. The root part is from another type of Ficus. Sometimes, branches sprout from this root part (called the “root stock”), and the leaves are different. Snip these new shoots off to keep them from taking sap from the Ficus ginseng grafted branches. Sometimes larger leaves appear because growth inhibitors had been sprayed on the plant while at the nursery. Growth inhibitors slow growth and reduce the size of leaves. When it wears off, leaves take on their natural size. If you want smaller leaves, defoliate your Ficus ginseng completely every time you prune (snip all leaves off with scissors). New leaves will grow back, smaller than before. Don’t do this more than twice a year. Also, remember to fertilize and repot on schedule because this drains nutrients away from the plant. Native to Asia, Ficus ginseng is grown under our latitudes as an indoor plant, most often as a bonsai. Its small size and thick trunk make it a very decorative plant, ideal for modern designer homes. The word “ginseng” means root in Chinese, and is attributed to this plant because of the magnificent aerial root. However, its very shiny dark green leaves are equally appealing. Since it is easy to grow and care for, it is often called the beginner’s bonsai. Its life cycle can span many years, even decades, and the key to a successful life is simply to provide appropriate watering. Ficus ‘ginseng’ is the common name for what is usually called Ficus microcarpa in the scientific community. The name “ginseng” refers to the appearance of the root. Actually the thick, bulbous stem was an underground part of the plant, which was dug out and planted about 4 inches (10 cm) above ground level. The Ficus ginseng plant is most often simply a Ficus microcarpa plant. 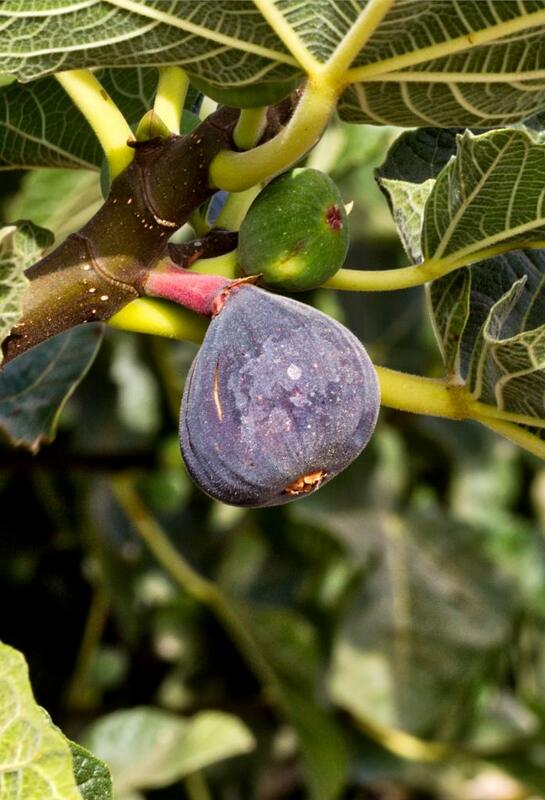 However, due to confusion between production centers, consumer stores and the general public, it also came to be known under the name Ficus retusa. 95% of all Ficus ginseng plants sold are actually Ficus microcarpa, with other varieties like Ficus benjamina, Ficus retusa, and lesser-known cultivars filling in the rest. Most Ficus ginseng have a cut trunk. This means that when the root was dug out and lifted up out of the soil, the original stem was cut, too. Some specimens were treated to have new twigs grow from the sides of the trunk. These are called non-grafted. Cutting the trunk was necessary to trigger branching out, otherwise all you’d get was a tall, spindly stem. Others are grafted, meaning branches are attached to the cut trunk. The advantage is that grafted branches open up parallel to the trunk, giving the ficus ginseng bonsai a more tree-like look. It’s also possible to select branches from smaller, cuter varieties. Usually grafts are performed with F. microcarpa branches, but sometimes other species (like Ficus retusa) are used on top of microcarpa roots… yet another confusing practice! Don’t confuse Ficus ginseng with Panax ginseng, the “original” ginseng plant used for its health benefits. 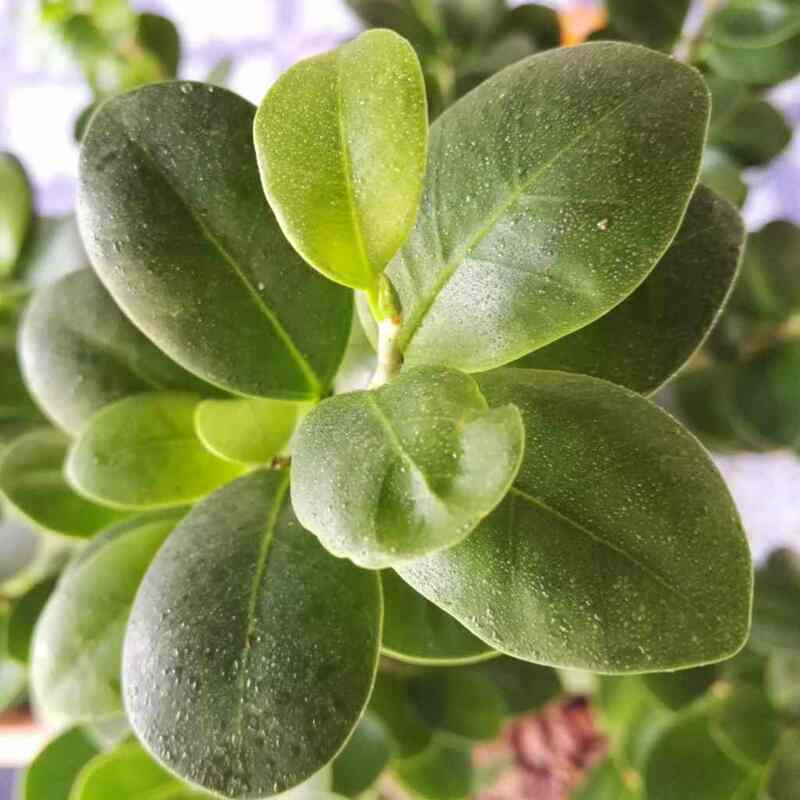 When only few leaves are visible, your Ficus ginseng might be confused with yet another thick-stemmed plant, Adenium obesum. Telling them apart is easier when the Adenium blooms, because Ficus ginseng plants rarely ever bear flowers and fruits. Ficus ginseng will appreciate spending the winter in a cooler spot, ideally around 60°F (15°C). I inherited a plant someone was going to throw away last year and still haven’t decided what it could possibly be? I have recently decided to replant it into a larger pot because it had been in this tiny ridiculously small wood type container with moss on the top. It had mold in it so I decided to just put it in new Cactus soil because I knew that was well-draining. It seems to be doing okay but hasn’t grown very much in the last year. It seems like it’s not exactly happy but surviving. It does not like to be in water and does well if it dries out for some time in between waterings. Right now I have it in a double-walled self-watering ceramic container that does not have glaze on the part where the plant sets. Mostly I’m just curious if there is anyone who can help me identify this poor little plant? I just want to be able to take great care of it and make it comfortable. The little container that it originally came in (I believe) had a barcode on the bottom so I don’t believe it is anything highly exotic. Sure thing! I just responded to the email you sent me. The plant you thought might be a Ficus ginseng actually turned out to be an Adenium obesa. Also quite a nice plant for bonsai-like pots! I read up on it and potted it again in a pot with holes this time and put it closer to some natural light in my kitchen. I cannot thank you enough! I am going to take very good care of this little guy and will send pictures when he blooms! You are too kind!! Thank you so much for the fast and detail feedback. I think I’m going to do this when I come back from a 2 week vocation in Ontario & Quebec. Hope it won’t get too cold for the plant when I come back. I have to leave it on the apartment balcony for the 2 weeks, it will not be much air circulation inside when I shut the glass doors. Sure thing, Bryan! It should be ok. All the best! Which is the best season to repot it? Should I prune it heavily during repot? It’s been over 2 years since I transfered my Ginseng Ficus to a bigger pot. I’m living in Richmond BC Canada, temperature by now is around 15-20C outside my balcony, it’s Autumn. – Now is a great time to repot: spring and fall are ideal. Repotting now means it’ll still have a full two months to settle in before the first frosts hit (November, I believe unless you’re higher up). – Yes, it’s possible to prune heavily, your ficus won’t take any damage from that. Just don’t prune too close to the root: sometimes the ficus ginseng is grafted, and if you don’t leave any leaves at all, it’ll send up new shoots out from below the root graft first of all, and this may not be the same leafage as the portion that is above the graft. – I’d recommend pruning live branches back by a third or eventually half, and removing dead twigs where you notice them. You’re right on schedule for this step! 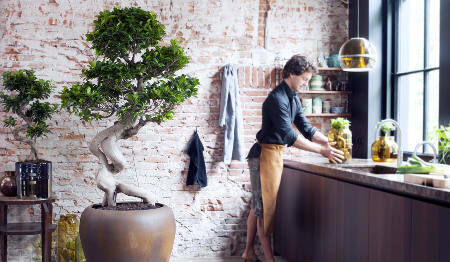 To help out, I’ve expanded the article a bit on the section about how to repot a ficus bonsai, it can serve as a guideline for you.